We look ahead to London art openings for September 2017 and select our must-see exhibitions to help you plan your cultural diary. You're welcome. 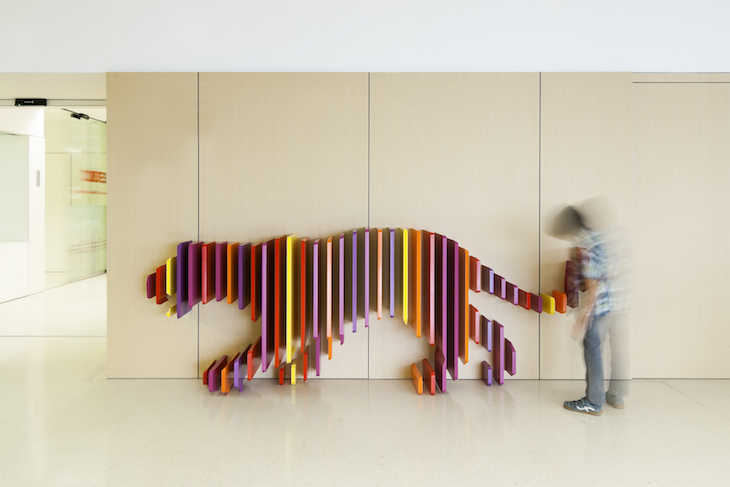 Graphic design and healthcare may seem like odd (ahem) bedfellows but it's a natural pairing. Think of all those posters we've seen in doctor's offices and pharmacies. They all carry powerful messages about looking after ourselves and they need to be as effective as possible — it's literally a matter of life and death. Head to the Wellcome Collection to explore how these two fields have come together over the last 60 years. Can Graphic Design Save Your Life at Wellcome Collection. 7 September - 14 January, free. The augmented reality works by Man A come to life when viewed through a screen. We sailed to the underworld and came face to face with a fire-breathing dragon, its hot breath on our face. This was just one of the fantastic virtual reality experiences in the the first edition of the 'Enter through the headset' exhibition, so we're massively excited to see what the second one brings. 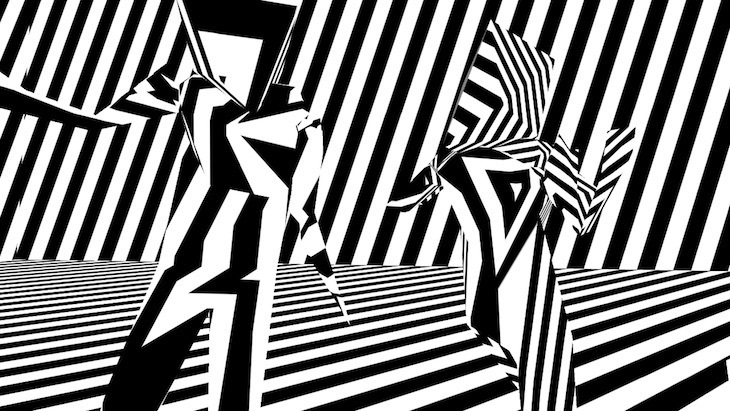 A Virtual Reality Exhibition: Enter Through the Headset at Gazelli Art House, 39 Dover Street, W1S 4NN. 8 - 30 September, free. Here comes a Scythian rider. © The State Hermitage Museum, St Petersburg, 2017. Photo: V Terebenin. Just who were the Scythians? They were neighbours and adversaries of Greece and Persia but we know very little about them. That's about to change as The British Museum launches a major exhibition about these Siberian mounted warriors, featuring over 200 objects, some of which have been remarkably preserved in the Permafrost. Think of them as the original Dothraki. 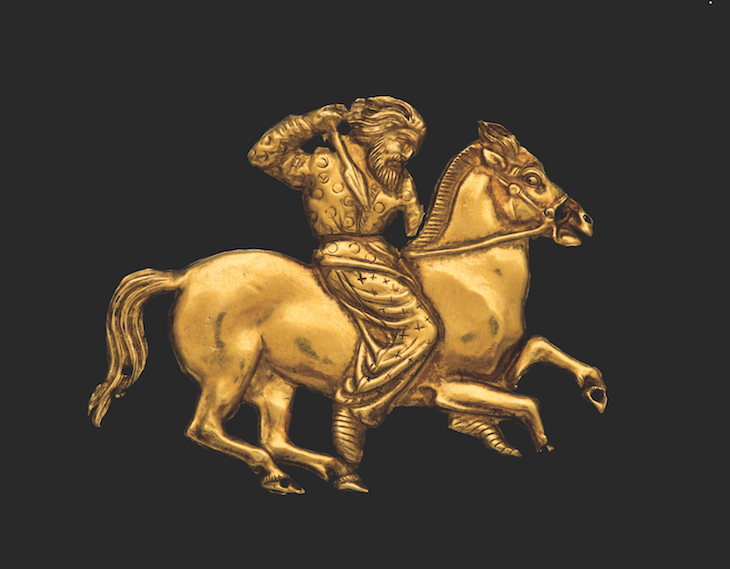 Scythians: warriors of ancient Siberia at The British Museum. 14 September - 14 January, £16.50. Copyright Nicola Hicks and courtesy Flowers Gallery. We're massive fans of the sculptures by Nicola Hicks — plaster and straw combine to create powerful bears, minotaurs and eagles, all life-sized or bigger. 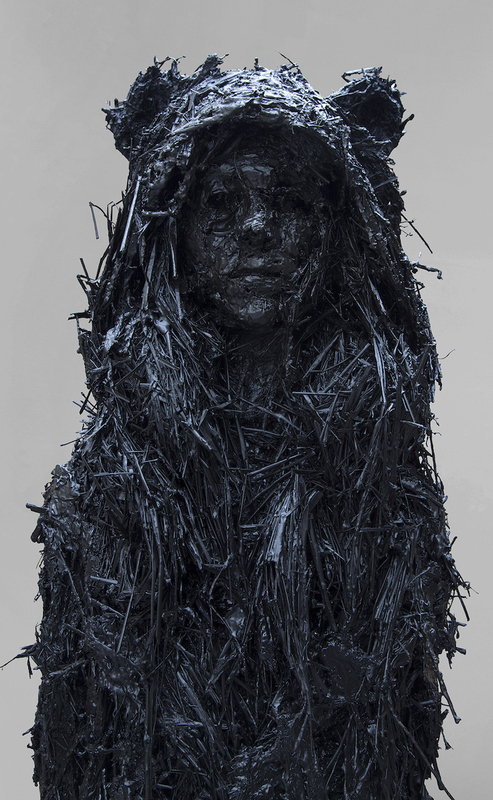 Her works are powerful and beautiful at the same time, letting your eye explore their dark crevices. We're a big fan of her drawings too so we're stoked that she has a big solo show coming up of her latest works. Nicola Hicks: Wabbling Back to the Fire at Flowers, 82 Kingsland Road, E2 8DP. 19 September - 11 November, free. 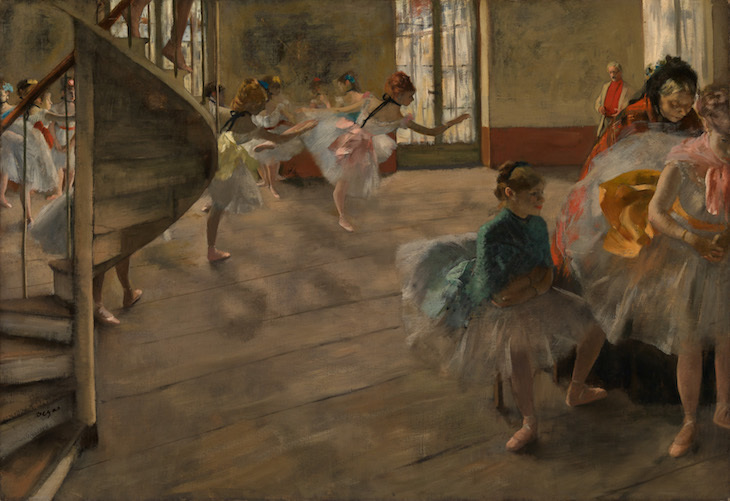 Edgar Degas was known for his paintings of ballet dancers but he had a much wider portfolio, covering both the rich and poor people living in Paris. This exhibition brings together both his paintings in The National Gallery and those in the Burrell Collection in Glasgow to give us every aspect of this innovative Impressionist's portfolio. Drawn in Colour: Degas from the Burrell at The National Gallery. 20 September - 7 May, free. © The Estate of Jean-Michel Basquiat. Licensed by Artestar, New York. Jean-Michel Basquiat's life story is a captivating one — starting from street art, protege of Andy Warhol, died of a heroin overdose at the age of 27 and last year one of his works sold for over $110m. This is before we even get on to his energetic paintings, drawings and poetry. His work was already remarkably diverse even though his life was tragically cut short. It's Basquiat's first ever major UK show so we're expecting something special. 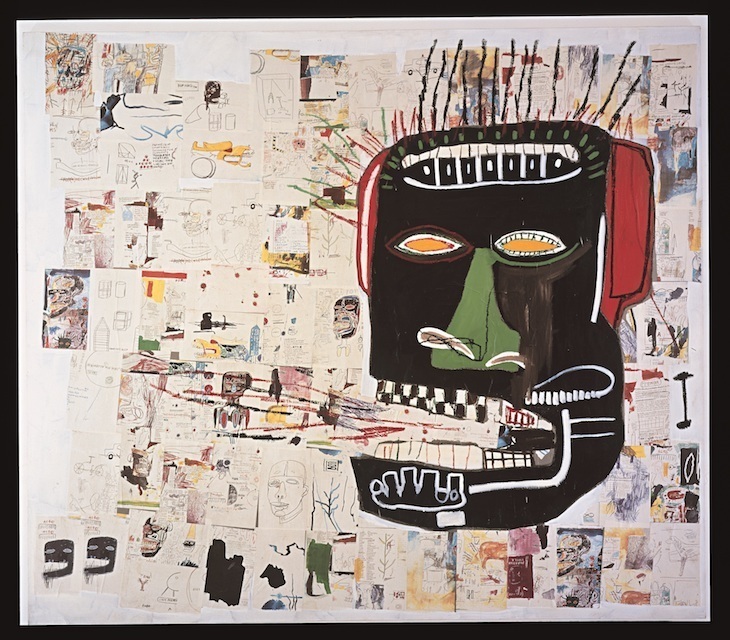 Basquiat: Boom for Real at Barbican Art Gallery. 21 September - 28 January, £16. 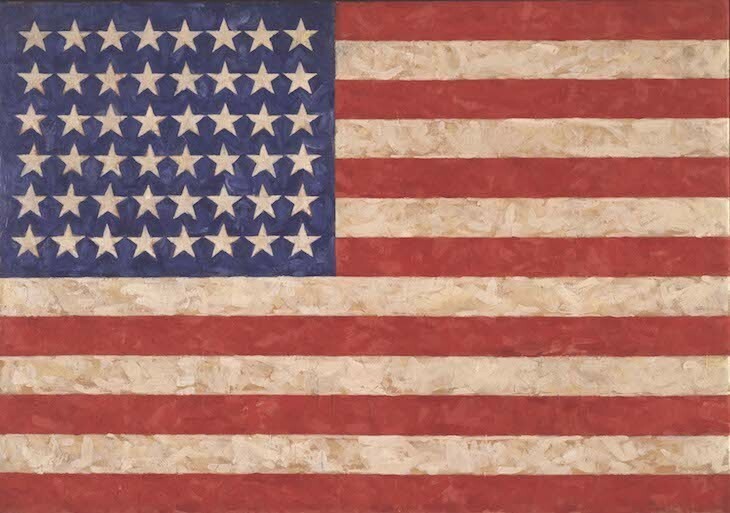 Jasper Johns is one of America's, if not one of the world's, greatest living artists. He's been at the leading edge of contemporary art since the 1950s, and he's still creating work today. He's best known for his flags and targets but this show will bring over 150 of his works together across the span of his career — from pop art to the conceptual. If you're new to Johns, the RA has a helpful intro to the artist. Jasper Johns: Something Resembling Truth at Royal Academy of Arts. 23 September - 10 December, £17. The White Cube is showing three artists that we're massive fans of. 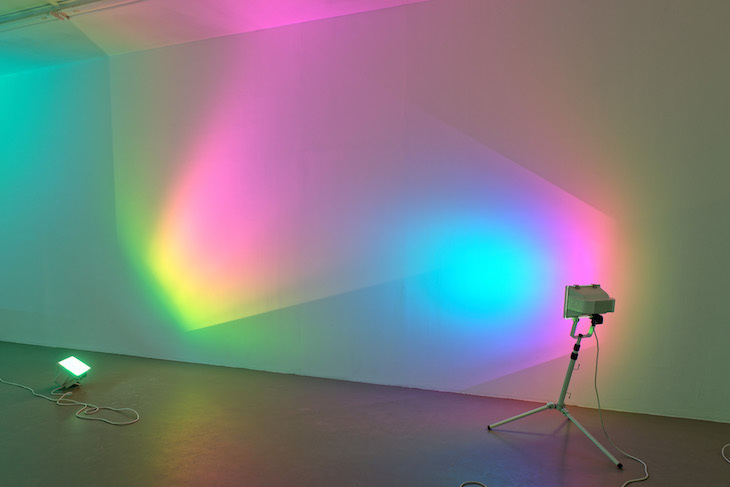 We love Ortega's surreal sculptures where objects seem to be exploding outwards, Ann Veronica Janssens had us lost in a coloured mist recently, and Cerith Wyn Evans lit up Tate Britain with fantastic light sculptures. With all three artists combined under one roof, this should be a sensational show. Cerith Wyn Evans, Ann Veronica Janssens & Damian Ortega at White Cube Bermondsey, 144-152 Bermondsey Street, SE1 3TQ. 27 September - 12 December, free. Expect colourful constructions. Image courtesy the artist. 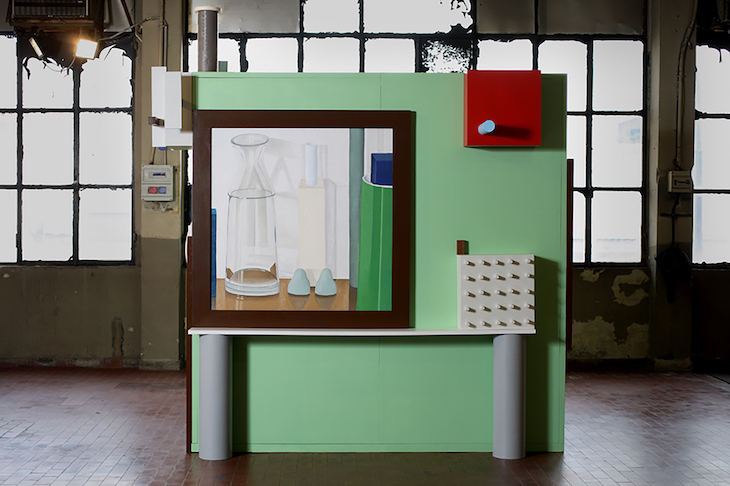 Nathalie Du Pasquier specialises in creating architectural installations you can wander through. All bright colours and straight lines, we love these clinical yet surreal worlds she creates. Nathalie Du Pasquier at Camden Arts Centre. 29 September - 7 January, free. 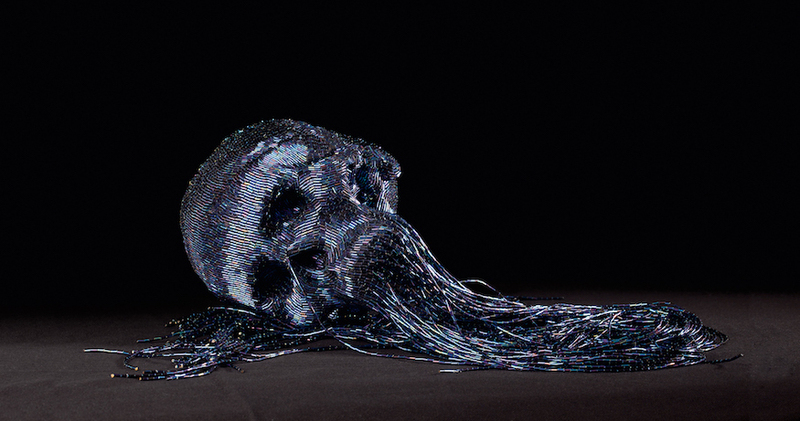 V&A has joined forces with Royal Opera House for an exhibition all about opera. This show should bring a whole new audience to the field with art, video and music charting the history of opera from its Italian origins to today — whether you know your Verdi from your Vivaldi or you're new to opera. 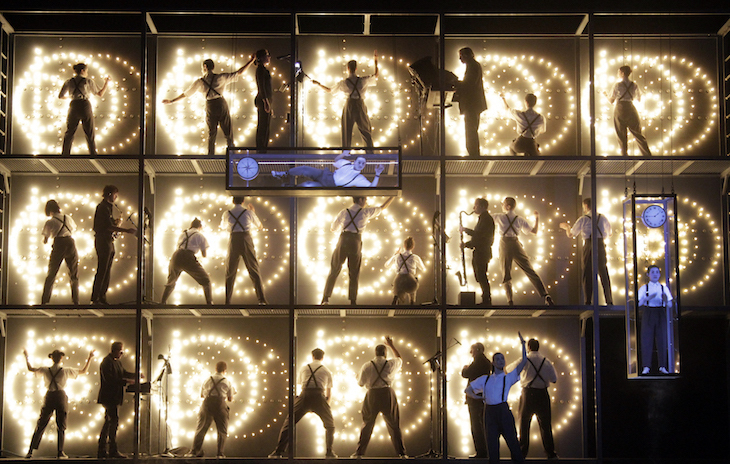 Opera: Passion, Power & Politics at V&A. 30 September - 25 February, £19. It's not just major blockbusters in September — there are plenty of art fairs and festival to enjoy too. Sarah Fosse's work will be at A River Runs Through It, an Oxo Gallery show as part of Totally Thames. Plus she's showing at Roy's People Art Fair. 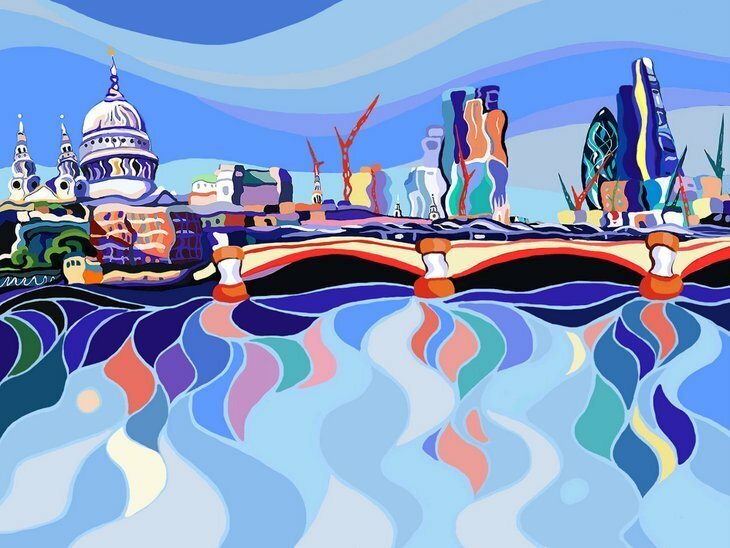 Totally Thames (1-30 September) is a month long celebration of our lovely river, with art, history, poetry and plenty of other events giving some much needed love to the Thames. If Design is more up your street, the London Design Festival (16-24 September) promises a colourful playground in Exchange Square, an immersive coloured lights-fest at V&A, and over 45o other events and projects across London. If all of that hasn't got you designed out, September is also Fashion & Design month on Regent Street, and speaking of fashion, London Fashion Week (21-24 September) will be bringing all its glamour and style to 180 Strand. 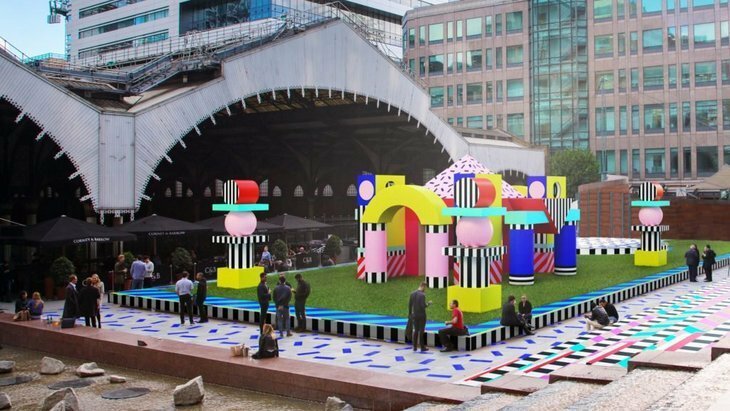 A mock up of what Camille Walala's playground will look like in Exchange Square, as part of London Design Festival. What about the art fairs, we hear you cry. Well we've got you covered there too. 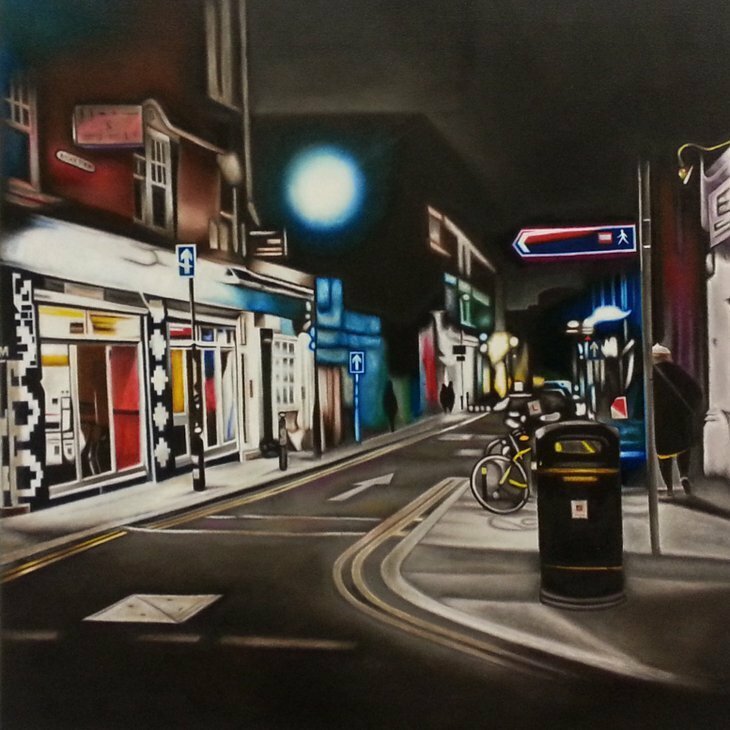 If you're looking for emerging artists selling work at reasonable prices then head to the New Artist Fair (8-10 September) at Old Truman Brewery or Roy's People Art Fair (15-17 Sept) at Candid Arts Trust in Angel. We've snapped up work by artists showing at both of these fairs. If you're looking at the higher end of the market with galleries from across the world then head over to Saatchi Gallery for the eye catching works in START Art Fair (14-17 September) or Victoria House for the second edition of international art fair Crossroads (30 September - 4 October). Andrea Tyrimos' street scenes will be at Roy's People Art Fair. Copyright the artist. For a combination of art and antiques, the opulent and beautiful LAPADA (15-20 September) will be returning to a marquee in middle of Berkeley Square. If fairs are too sales-focussed and you're just up for experiencing some great art, then the Art Licks Weekend (29 September - 1 October) takes us off the beaten path to some quirky art spaces. In previous years, we've seen art in a living room, a hairdressers and inside the back of a van. That's our mammoth September update, now it's over to you to get planning on which ones to see.